Patriarchal blessings – how do they work? Punctuation and verse allocation – why don’t they work? Heaven – HOW DOES THAT WORK? Joseph tells the believers to throw a party with the rich and educated on the VIP list, because who needs consistency with the Book of Mormon when Zion has been found? Edward Partridge is treated like a toddler for (apparently) making bad decisions, but that’s okay, he’s still the Bishop in charge of the Bishop’s Storehouse. Drink Count – 12, or a bit over one beer. Lucy (the Valiant) Pevensie is the youngest of the Pevensie siblings in C.S. Lewis’ series The Chronicles of Narnia. While I won’t gainsay anything Bryce had to say about the Mormon belief in the agency of human beings after they die to continue to follow or not follow commandments, your discussion of this verse is dependent on the assumption that “whether in life or in death” is a modifying clause of “keepeth”. But remember, the syntax of this world is foolishness with God. Instead, I think “whether in life or in death” is supposed to describe the word “blessed”, meaning if you obey the commandments of God, you’ll be blessed, just don’t be surprised if nothing good happens to you in mortal life. That doesn’t make the promise of blessings a lie, it just means your blessing with come to you in death. WILL come to you in death, I meant, not WITH come. Jeez, how am I supposed to keep up my pretentious façade when I can’t even edit my posts? – The Church of Christ (who are often called “Hedrickites” because a lot of the little schismatic movements went back to the original 1830 church name, and it’s confusing). The Hedrickites own the smallest, but most prestigious, piece of the pie wedge, the very spot where Joseph Smith and company laid the cornerstones for the temple. There’s a little white church building on the property, but no temple. They intend to never sell the property, come hell or high water, and hold it until the time is right for the prophesied temple to be built. The LDS church owns a fairly large chunk of the lot, as much of it as they were able to buy back in the early 20th century. Even though the church eventually had need of a new temple for the greater Kansas City area, and announced one in 2008, they of course didn’t use this available property for it. They made sure to put it just a click north, in Clay County. They couldn’t go placing a run-of-the-mill temple here, in JACKSON COUNTY, and set faithful hearts all a patter thinking they were ready to build THE TEMPLE to which Jesus would return. They’ll never presume to build THAT temple, not without a new revelation, I expect. They wouldn’t dare anticipate the Second Coming so specifically. 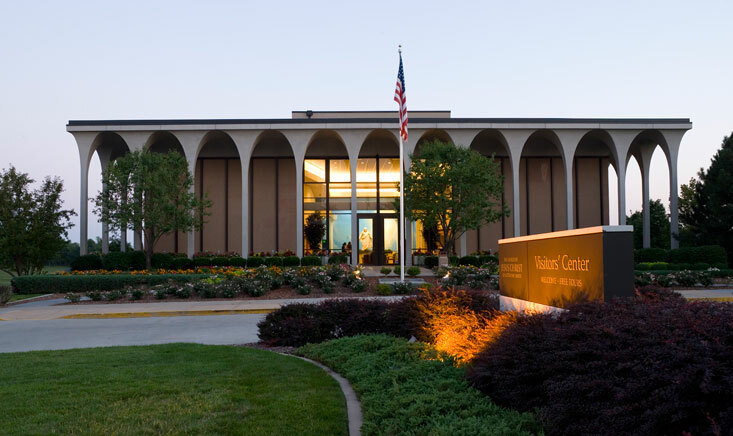 But the church did build a stake center there, as well as a visitors center, not much different than any of their other visitors centers, except a bit more focused on church history in Missouri. 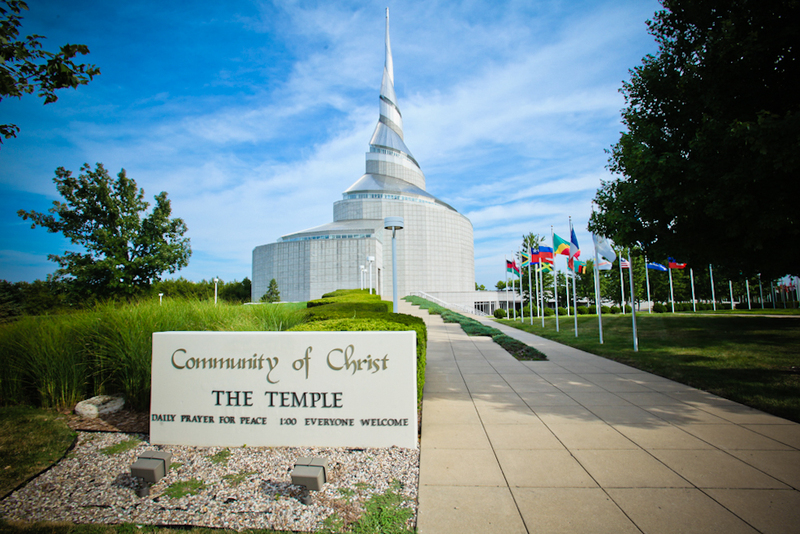 As for The Community of Christ, on the other hand, they apparently considered the building of a temple to be more of a commandment than an end times prophecy to be fulfilled, and completed their own Independence Temple in 1994. You’ll notice, on the placard, a different attitude than the LDS have about exclusivity where their temples are concerned. Though Joseph Smith laid the cornerstones for a single building, the idea was to build a complex of 24 separate buildings that would together constitute the temple. These buildings would take up two city blocks at the center of the planned Zion community. The church leaders drew up a city plan, known as the “Plat of Zion”. Back in 2009, historian John Hamer wrote a great article on the history of the Temple Lot, from which I appropriated the diagram at the top of this post, and the Plat of Zion picture. One interesting fact he points out is that if the church had developed this city plan from the Temple Lot outward, their city would have completely subsumed the existing non-Mormon settlement in Independence. I wonder, why did the Missourians hate the Mormons so much?